Author(s): Christoph Kubisch, Christian Tietjen, Bernhard Preim. Article: International Journal of Computer Assisted Radiology and Surgery, Vol. 5, No. 6, pp. 667--678, 2010. Purpose The rating of distances and infiltrations to vital structures is important for the planning of tumor surgery or interventional procedures. To support such an assessment, the target structures should be clearly emphasized in a 3D visualization by ensuring their visibility. Methods Smart Visibility techniques such as Ghosting Views and Breakaway Views are employed. Ghosting Views highlight focus structures by fading out occluding structures and are often used in anatomical illustrations. Breakaway Views reveal the structure by cutting into surrounding structures. As a result, an intersection surface is created that allows relating the focus structure with its surroundings. 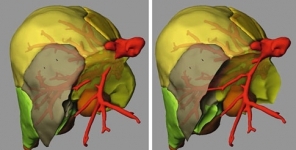 In this contribution, a specialized GPU-based implementation of these techniques is presented for polygonal models derived from a segmentation of the anatomical structures. Results We present different rendering styles of the techniques and apply them to highlight enlarged lymph nodes in the neck, as well as tumors inside the liver. Compared to other methods, we focus on polygonal models and optimizations. Thus, very high frame rates could be achieved on consumer graphics hardware. Furthermore, we employed markers that support the estimation of distances within the scene and possible infiltrations around the focus structures. Conclusion The parameters for the techniques are defined automatically to aid the employment in clinical routine. Such an application is also supported by the combination and refinement of established rendering techniques.